Nine races held over three days of racing at the Audi Melges 32 European Championship have produced nine different winners in the individual races and a closely-packed overall classification. Following a less than brilliant day, Vincenzo Onorato's Mascalzone Latino (ITA) hangs on to the overall leadership by just one point over Jason Carroll's Argo (USA). 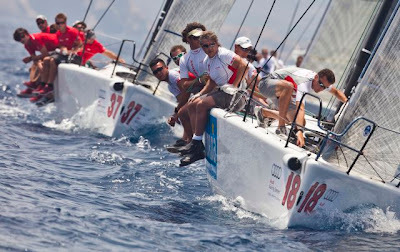 The Italian boat Torpyone, owned by Edoardo Lupi and Massimo Pessina, sits in third place just four points behind the leader while Lanfranco Cirillo's Fantastica and Naofumi Kamei's Mamma Aiuto! are close behind in fourth and fifth place respectively. With only one windward-leeward to be held in tomorrow's final race day to take the fleet to the full quota of 10 for the regatta, the conquest of the European title depends entirely on the final race of the series. 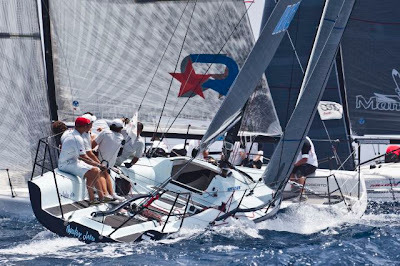 Organized by the Yacht Club Costa Smeralda in collaboration with B-Plan Sport&Events, the regatta is taking place from 28th June to 1st July in Porto Cervo. Light Sirocco breezes, which touched 14 knots in race eight but mainly blew at approximately 10 knots, once again accompanied the 22 competing boats throughout the three races held today. Race Seven saw Torpyone, with Branko Brcin calling tactics, round the top mark in fourth before climbing to second place behind race winner Brontolo (ITA) and ahead of Japan's Mamma Aiuto! in third. Although Calvi Network (ITA) got off to a good start in Race Eight, John Kilroy's Samba Pa Ti (USA) moved into the lead ahead of Brontolo and Opus One (GER) on the first downwind leg and all three held their positions to the finish. In the final race of the day it was the turn of the two competing Japanese boats to shine as Mamma Aiuto! claimed their first bullet of the series - in a day which saw them rise from 13th to 5th place overall - while Yasha Samurai took their best result so far with a third place finish behind France's Teasing Machine. Australia's Nathan Wilmot, double Olympic gold medal winner in the 470 class and tactician aboard Mascalzone Latino was disappointed with today's 15-17-6 scoreline: "It's close, it's hard. Today we didn't have a very good day and the results are really tight so we have to try to do better. Tomorrow will be important but we are still learning at the moment, today we had a few incidents which probably cost us about 10 points in total but tomorrow is another day and hopefully we can get back to where we need to be and stay in the lead." Argo's tactician Cameron Appleton was equally hopeful for tomorrow: "There are so many people in the hunt and different people doing well in different races, the competition is extremely tight. We didn't feel we had a great day but to be one point off the lead is great. There's just one race tomorrow so now we just have to go out there and have the best race of the regatta and if that is the case then we can win."